Eating fruits and vegetables isn't necessarily a problem in my household. For the most part, my kids will eat whatever is set in front of them. I know, though, that the struggle is real. Birds Eye, the number one name in frozen vegetables has introduced a first-of-its-kind frozen offering, bringing nutritious, veggie-rich side dishes to kids, featuring Disney characters they know and love. It's definitely one way that might get kids to be more excited about consuming vegetables. The Disney offerings by Birds Eye feature pastas in the shape of favorite Disney characters from Frozen, Disney Pixar's Cars, and the classic characters Mickey Mouse and Minnie Mouse. I shopped at a handful of stores before finding one that carried this variety of vegetables. I was able to locate them at my local Hyvee. I picked up three of the varieties, excluding pasta and carrots. Each bag has enough to feed 2-3 people. The vegetables can be microwaved right in the bag, then eaten. They're quite tasty and the pasta shapes are appealing. For instance, the Disney Pixar Cars variety has pasta shaped like cars and trucks. Through delicious, innovative products like these, Birds Eye is striving to increase vegetable consumption among families with convenient and flavorful veggie-filled options for every age group. For more information on Birds Eye products, please visit www.birdseye.com. 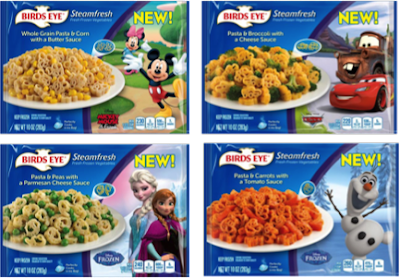 One person will win free product coupons for Birds Eye Steamfresh Disney Vegetables and a prize pack of Disney merchandise. That is so fun. My boys really like frozen. I want the Pasta with carrots & Tomato Sauce. I am pretty sure that my grandson would really like this one; Pasta & Peas with Parmesan Cheese Sauce. I want to try the pasta broccoli and cheese. The Pasta & Peas with Parmesan Cheese Sauce look interesting. I am most excited to try the Anna and Elsa! My girls would LOVE it! I want to try the Pasta and Carrots with Tomato Sauce. I would love the Pasta & Peas with Parmesan Cheese Sauce! My sons would also! I would like the Pasta, Broccoli, & cheese one. I would love to try the Pasta & Broccoli with a Cheese Sauce variety. I'd like to try the Whole Grain Pasta & Corn with a Butter Sauce first. I would like to try the pasta and broccoli with a cheese sauce. My family would like the Pasta and Broccoli with Cheese Sauce. My boys would like the Whole Grain Pasta & Corn with a Butter Sauce! I would love to try the Pasta & Peas with Parmesan sauce. I like to try the pasta with broccoli and cheese. I think the Pasta & Peas with Parmesan Cheese Sauce sound really yummy! I would like to try the Pasta & Peas with Parmesan Cheese Sauce. This sounds good. I have always loved Birds Eye! I would love to try the Pasta & Broccoli with a Cheese Sauce! I would love to try the Pasta & Broccoli with a Cheese Sauce! I want to try the Anna and Elsa - pasta and peas with a parmesan cheese sauce! I would like to try Anna and Elsa - pasta and peas with a parmesan cheese sauce. I think that my kids would really enjoy the pasta and broccoli and cheese sauce! What a fun way to get kids eating their veggies! Thanks for the chance. I would love to try the Pasta & Peas with Parmesan Cheese Sauce. I'd like to try pasta and peas with parmesan sauce. Sounds so yummy! My favorite is the pasta and peas variety. Our kids would also like this variety because of the pasta shapes. I would like to try the pasta with carrots and tomato sauce. My kids I think would love the Pasta & Peas with Parmesan Cheese Sauce. The pasta and cheese with parmesan sauce sounds the best to me! id like to try the yummy Pasta & Broccoli with a Cheese Sauce. My kids would probably like the pasta and peas with a parmesan cheese sauce the best. I would like to try the Dixney Pixar cars. We would love to try the Pasta & Peas with Parmesan Cheese Sauce! Oh I am most excited to try the Mickey Mouse and Minnie Mouse Whole Grain Pasta & Corn with a Butter Sauce! I would really like to try the pasta and broccoli with a cheese sauce. I am excited to try the Olaf - pasta and carrots with a tomato sauce the most. I'd try the Pasta & Peas with Parmesan Cheese Sauce. I would most like to try the Pasta & Broccoli with a Cheese Sauce. I'd like to try the Pasta & Peas with Parmesan Cheese Sauce. I can't wait to try the pasta with carrots and tomato sauce. Whole Grain Pasta & Corn with a Butter Sauce sound like it might be tasty. I think out of the four varieties of Bird's Eye Disney Pasta I am most excited to try the Disney Pixar Cars - pasta and broccoli with a cheese sauce. Pasta with Broccoli in cheese sauce! I would try the Pasta & Peas with Parmesan Cheese Sauce first. Pasta & Peas with Parmesan Cheese Sauce. I am the most excited to try the Pasta & Broccoli with a Cheese Sauce. Wow - kids should love these! Pasta & Peas with Parmesan Cheese Sauce sounds good! I think my grand kids would like to try the pasta and peas with Parmesan cheese. i want to try the Disney Pixar Cars - pasta and broccoli with a cheese sauce. I'm excited to try the Pasta & Broccoli with a Cheese Sauce flavor! Disney Pixar Cars sounds perfect! I am most excited to try the Mickey and Minnie flavor first!